Happy Friday and welcome to the latest edition of Friday in the Sun. I’m on my way to an unfortunately timed wedding in the Lower 48 so this week’s edition will be a little light on the gossip and rumor and a little heavy on the geeky breakdown of APOC numbers. Don’t forget to vote on Tuesday (or earlier). I’ve got plenty of data projects in mind and I need the best data possible. Nowhere has it heated up quite as much as House District 9, where Rep. George Rauscher and former Rep. Jim Colver have both attracted significant independent expenditure spending according to our tally. Total spending for Colver has equalled $56,509.63 with $43,729.21 from the union-backed Putting Alaskans First and Working Families of Alaska supporting him and $12,780.42 opposing him. That opposition has come from the Alaska Republican Party and an independent expenditure group called Families of the Last Frontier, which is solely funded by the Republican State Leadership Committee. Meanwhile Rauscher has been targeted by a grand total of $15,034.54. $6,034.54 of that is supportive spending coming from the Family Policy Alliance and Families of the Last Frontier. Working Families of Alaska has already committed $9,000.00 to the race. It’s entirely likely that spending has already surpassed those figures, but groups aren’t required to immediately report spending. We’ve heard as much as $40,000 could materialize in last-minute spends against Colver. There’s also a newly formed group, Friends of Pam Goode, that will likely drop some last-minute money on the race. Goode is certainly in the position to play spoiler to the incumbent Rauscher. She’s run previously in the general election under the Alaska Constitution Party and netted more than 2,000 votes her head-to-head race against Rauscher in 2016. The purpose of the spending is clear. Former Rep. Colver is a moderate who helped coin the Musk Ox Coalition–a group of moderate Republicans–before he fell on the outs with district party leadership and was defeated in the 2016 primary (by a super-slim margin). The remainders of that coalition–Reps. Gabrielle LeDoux, Paul Seaton and Louise Stutes–all went on to be critical pieces of the House bipartisan coalition. It’s hard to imagine Colver wouldn’t have followed suit. The list of competitive House seats isn’t particularly long this year, and most of those competitive races would seem to favor Democrats, independents and moderate Musk Ox-y Republicans (there’s maybe three or four seats that can realistically go to solid Republicans while there’s easily five or more that could swing in favor of House bipartisan coalition. We’ll talk more about those races in the coming weeks). Rep. David Eastman is putting his independent expenditure group, the Alaska Conservative Leadership PAC, to work against three members of his own legislative coalition. He’s sent out mailers opposing Reps. Chris Birch, Charisse Millett, Lance Pruitt and DeLena Johnson and supporting Birch primary challenger Bekah Halat (who’s facing a felony charge for welfare fraud), Johnson primary challenger Edna Devries, Millett challenger Josh Revak (who’s got nearly $30,000 in support from a separate group) and Rep. Lance Pruitt challenger Don Jones. Reporter Nat Herz tracked down a copy of the mailer that Eastman’s PAC is sending out, and the chief complaint is that the four candidates have received backing from the Alaska Republican Party in a contested primary. The Alaska Right to Life campaign has revoked a whole bunch of endorsements and has launched its own set of independent expenditures targeting Republicans in contested primaries. According to the group’s website, it’s revoked endorsements for Rep. George Rauscher, DeLena Johnson and Cathy Tilton with more on the group’s bad side for refusing to participate in the group’s survey. We’ve seen reports of mailers targeting Rauscher so it’s a safe bet that voters will also be getting mailers on Johnson and Tilton. And because APOC’s website is so easy to navigate, here’s all the independent expenditures that we could find targeting candidates in this election (our initial scan left out anything by Eastman’s PAC for some reason so thanks to Nat for spotting those). One of the most hotly contested primaries that’s completely vacant of independent expenditure spending is the three-way primary for the very blue House District 20 between Cliff Groh, Elias Rojas and the Les Gara-endorsed Zack Fields. This parody IE popped up in our inbox (I have to point out that it’s parody because thought it was real at first… I’ve been spending far too much time with APOC reports lately). 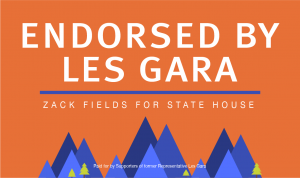 Did you know the Les Gara-endorsed Fields has been endorsed by Fields-endorsing Les Gara? The independent expenditure game won’t stop giving. 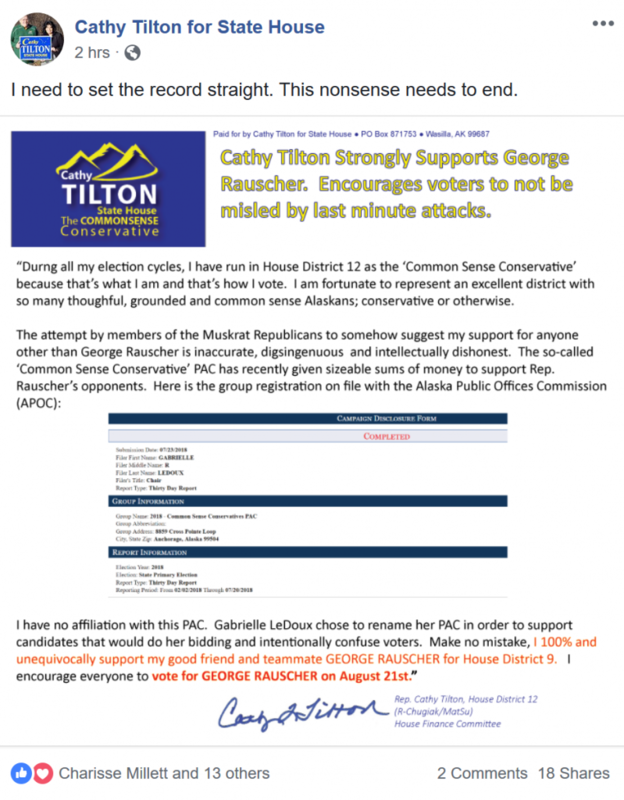 Rep. Cathy Tilton is outraged that Rep. Gabrielle LeDoux dare rename her PAC, formerly Gabby’s Tuesday PAC, the Common Sense Conservatives PAC and thereby stealing a term that Tilton had apparently owned the trademark on. After getting a bit of flak about including 24-hour reports in our campaign disclosure breakdown from earlier this week because they only captured contributions that are more than $250. We went ahead and limited the breakdown to just what was reported in the 7-day reports and prior, but because we can never stay away from messing around with spreadsheets and APOC reports we’ve gone ahead and tallied up every 24-hour report. House Majority Leader Chris Tuck, D-Anchorage, hasn’t raised a single dollar from an individual this campaign season. Though it might be easy to read into what this might mean for his political future, we’ve heard that some personal issues might have sidelined the effort and we’ll see him kick into gear ahead of the general election. He’s collected $6,500.00 from group contributions and still has nearly all of that money in the bank. On the Republican side of the ticket, Connie! Dougherty has raised $17,148.99 (though it’s mostly due to $12,748.99 of personal contributions to her campaign) with just $4,400.00 coming from individual contributions. Democrat-turned-Republican Forrest Forrest McDonald has raised a total of $5,475.94 with $4,490.00 of that coming from individual contributions. An attack sign? That may be a first. Last week, we highlighted Juneau House candidate Jerry Nankervis’ fundraising flyer. Since then, one reader pointed out that on the list of meats that Nankervis had advertised at his $40-per ticket fundraiser is moose chili (it’s illegal to buy, sell or barter game meat). Juneau resident Carole Triem became the latest progressive woman to join this year’s field of women running for office in what’s already been a banner year for female candidates. She filed for Juneau Assembly in style, repping Seattle-based Sup Pop records. It certainly was a head-turning entrance to the race. Speaking of women running for office, Tanana Chiefs Conference employee Marna Sanford is running for office in the Fairbanks North Star Borough. 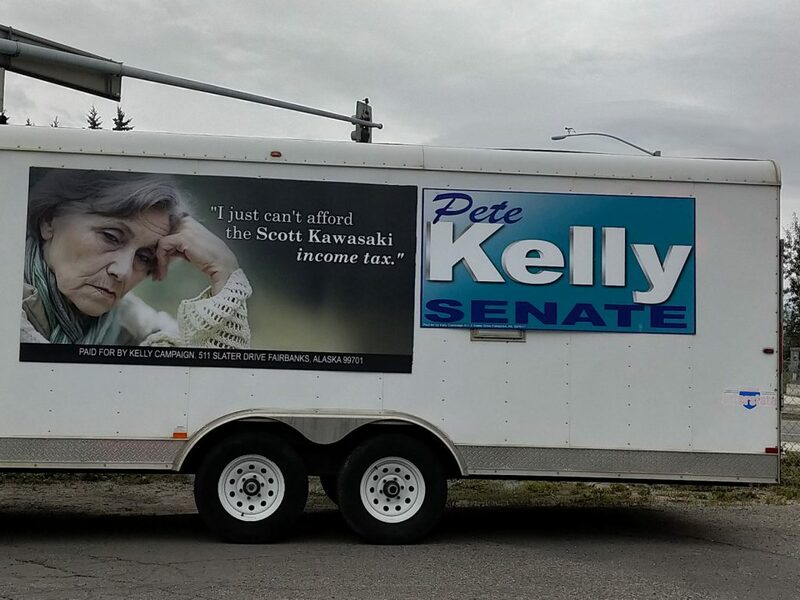 Therefore it comes as news to us that there’s Supreme Court Jusice Marna Sanfrod also running around Fairbanks, contributing some cash to Scott Kawasaki. Those are the chances that FiveThirtyEight gives independent congressional candidate Alyse Galvin of unseating Republican Rep. Don Young in this year’s elections. That’s gotta be the best chances anyone’s had to unseating the Dean of the House, though we feel like we say that every time he’s on the ballot. Galvin still has to lock up the Democratic Party’s nomination on Tuesday. Just don’t call her a Democrat. I’m sure 45 is quaking in his boots. Alaska Sen. @lisamurkowski commented on @realDonaldTrump calling of former political aide Omarosa Manigault a “low life” and a “dog”. “The president has gone beyond the bounds of decency. Calling names, regardless of who they are directed to, needs to stop,” Murkowski said. To close out this week’s post with a little bit of good news, the Interior Veterans Cemetery in Fairbanks finally has a home at Mile 344 of the Parks Highway. The project has long been a priority for the retiring Rep. David Guttenberg, and was one of the first capital projects that caused your humble editor deep confusion during my first year in the capital year. Glad to see that the long-challenged project has finally found a home. 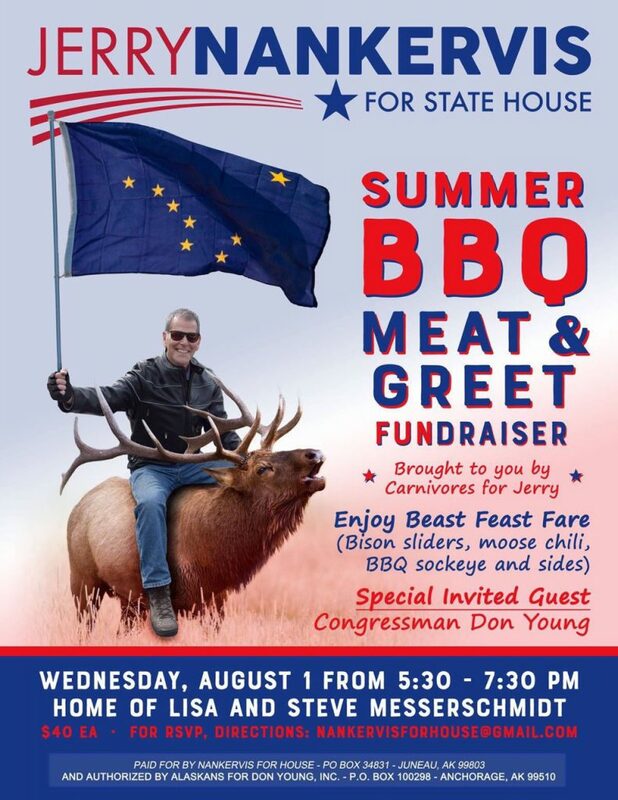 1 Comment on "Friday in the Sun (Aug. 17): The Primary Numbers edition"
Just to be clear on Jerry Nankervis Summer BBQ flyer…moose meat was not bought, sold or bartered, it was donated for a BBQ buffet. The $40 was a donation to attend the event, not to purchase moose chili. Can you imagine how many rural fundraisers would be illegal according to the complainers logic? It was a fun flyer and people with a sense of humor got it, as you did the week before – thanks by the way.